Bison: "Meet the Better Meat"
This month, as an Allrecipe Allstar, I was given the opportunity to expand my palate and experience one of the best healthy animal protein options out there today...bison. I fully admit, my experience with bison has been very limited. Bison do not roam the prairies of Ohio...(wait, there are no prairies in Ohio!) I remember having a bison burger one time in a local restaurant years ago. I remember it being good...but that's where my bison story ends. I was very excited to be a part of this campaign with The Bison Council and Allrecipes. So I began my adventures with bison by going onto The Bison Council's website and educating myself a bit on the wonders of bison. The Bison Council's website is great resource for all things bison. According to The Bison Council, bison steaks should be cooked at a lower temperature than beef steaks and served medium rare. Over cooking should be avoided because of the lower fat content. It can cause the meat to become tough and the high iron content to deplete. Equipped with all this newly learned information I was ready to get cooking! Early in the assignment we were given a list of recipes to choose from using bison. 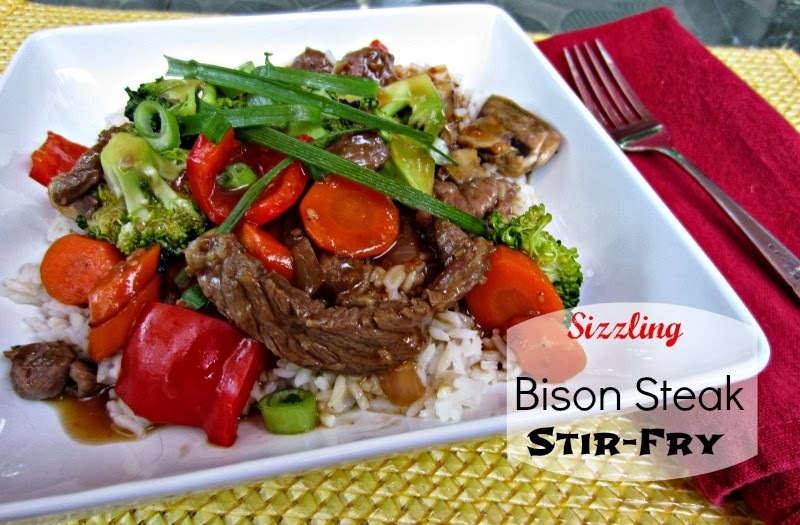 I chose the Sizzling Bison Stir Fry recipe because it used a cut of bison I had never tried (rib eye) and my family loves a good stir fry. When my package arrived from High Plains Bison (the company supplying the bison for this assignment) I was really excited. I had no idea what the bison steaks would look like, let alone taste like. (I only wish now that I had gotten a shot of the raw vacuum packaged steaks!) Inside the box were 4-9 oz. rib eye steaks! They looked very comparable to beef rib eye steaks, but darker in color and with less marbling. I have to admit, I was a bit skeptical using rib eye in a stir fry. I was even more skeptical once I read that because of the lower fat content in bison, it should be cooked at a lower temperature than other animal proteins and the steaks should be served med/rare for best flavor. Traditionally, a stir fry is made using high heat, to sear the meat and vegetables quickly. The directions for this stir fry recipe did, indeed, instruct you to cook it on med/high to high heat, so although it is NOT what is recommended for bison steaks, I did as the recipe said. The Sizzling Bison Stir Fry recipe for me, was just ok. At first taste, I enjoyed it, but by the end of the meal there were a few negatives. The positives were the sauce had good flavor, the meal was very quick to put together, and there is just no denying the health benefits of bison. The negatives in this recipe were the bison ended up a little chewy and with a slightly off flavor. I can't say whether it was the sauce or the cooking method that is to blame. But thankfully, I had two more steaks to prepare any way I chose. (thank you Bison Council for your generosity!) I don't know about you, but the only way I like to enjoy a rib eye is grilled. I searched The Bison Council's site for a recipe, and ended up making a very simple, but very delicious one...Char-grilled Bison Ribeye Steak with Creamed Corn and Spinach. I cooked the steaks to rare-med/rare (120 degrees F on my instant read meat thermometer) on bit lower temperature than I would normally cook beef steaks on, then let them rest for 10 minutes loosely covered with foil. .Char-grilled Bison Ribeye Steak with Creamed Corn and Spinach. FINALLY! I could see what everyone was raving about! THIS was obviously the way to prepare bison ribeye steak because it was DELICIOUS. It was tender, and juicy, and flavorful. I had only planned on eating half a steak, but it was so good, I ended up eating the entire thing...guilt free because of the lower fat and calorie content of bison! So ends, this exciting (for me anyway!) adventure with bison rib eye steaks. I am really happy it ends on a happy note. I would like to try other cuts of bison in the future, if they became available for purchase in my area. I have seen ground bison at the stores, but that's where the selection ends. Such a shame, because bison has so much to offer. How about you? Do you have any experience eating or cooking with bison? If so, I'd love to hear about it! I've had bison burgers a few times. The first time was when I was a kid and my uncle made it from what he hunted. It was amazing! Yes, when bison is prepared correctly it is delicious! I was so excited to see another blogger sharing the merits of bison! I did very long ago, so long ago that I'm pretty sure not a single person has seen it but myself. Bwah! The downside is the cost but I try to fit it in when possible. I once got huge roast half price at our health food store (they sell local meats and yes, bison do roam our prairies but on farms) for half price - that was really exciting! I usually just buy the ground bison since it's cheapest, and use it for burgers or in place of ground beef for any other recipe, such as in meat sauce for spaghetti, or taco meat, etc. I've never had a bison steak but it looks really good! I know...I think right now this is the least viewed of all my posts. I think not only price is an issue, but availability as well. (at least for much of the country) You just can't deny the health benefits of bison. The steaks are wonderful when prepared correctly. Great score on the half price roast! Wow, I never knew this! This is so interesting. 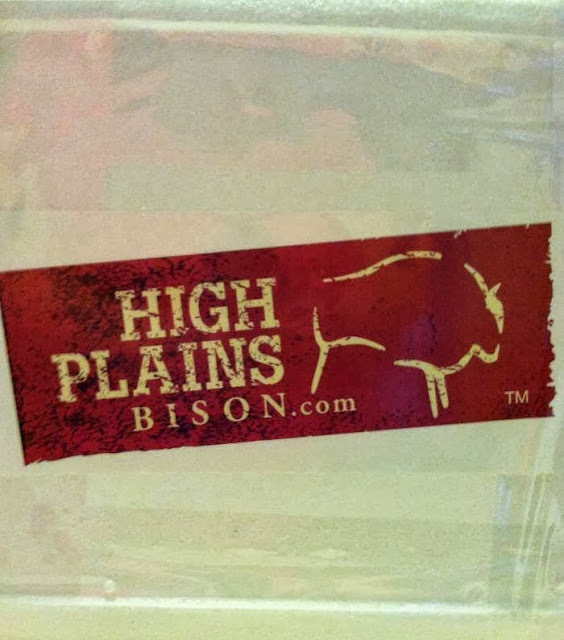 I am going to have to keep an eye out for Bison meat to give it a try. We really enjoyed the steaks! Thanks so much for stopping by!